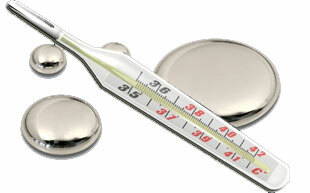 A broken Mercury-laden Thermometer – A bad idea! There are thousands of web pages out there giving advice on heavy metal toxicity. Some are better than others. However, to the astute observer, it often becomes clear that much of the advice is very prejudicial (towards a type of product or particular philosophy), and little of it is backed by experience. For example, no matter how good the “binding action” or chelating action of a substance is, using it will “liberate” more metals than the agent can handle. How do we know this? From emails from a multitude of individuals seeking help with clay therapy after experiencing severe problems with IV and/or oral chelation. The biggest problem we’ve noticed? People get scared. After being told that something is completely without side effects, they watch themselves or loved ones downward spiral out of control. They don’t know what to do or who to trust. Fear is often a paralyzing force. The following example is rather typical, and briefly follows a severe case of acute mercury toxicity from a broken thermometer. I’m sharing this “blog-style” because I want people to see how clay therapy works in the real world. “Hi. Desperate. My youngest broke a thermometer and was diagnosed with mercury poisoning. She showed all symptoms and I was told Dmsa was the best way to chelate, but I’m not sure if it’s really working all that well. “Now my 5-year-old has severe symptoms. She has headaches peeling skin and the skin between fingers are starting to break open and bleed. She also complains of a stomach ache and a lame feeling in her neck and lots more. Doctors here can’t treat her as they all say that the mercury is not dangerous. It’s been almost 3 weeks and I watch my baby girl getting weaker everyday. Can I use the clay for her and which one? What dosage and can we all use it as we all were exposed to it. I’m positive after reading about clay, can we still help before it’s too late? What are the costs for what I need and how to get it to South Africa? How do I order? Both the girls and myself suffer terribly with constipation, will it be ok to use the clay? What kind of doctors don’t see the danger of any kind of mercury exposure? It’s bad enough that the medical profession skews data (guilty by reason of data omission) regarding mercury in mercury-laden vaccinations and mercury in amalgam fillings. But direct mercury exposure? Strange and disturbing. South Africa is too far away for us to ship enough clay for successful therapy without it costing a fortune. I need to find a local source of clay for this family. My response included a suggestion to take clay baths with at least six cups of bath clay, for the children to take 1 tsp of clay in a glass of water twice daily, to use lemon water for blood/liver cleansing, and cilantro to help eliminate the mercury, and an herbal formula for constipation of it were to persist with internal clay use. My response included a link to my original “generalized” acute/chronic metal and toxicity post. 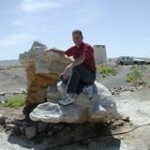 “…I’ve finally managed to locate a place for buying the bentonite clay. Thank you so much for your help. I don’t exactly know how to use it, but I will ask if they can advise me. I feel both hopeful and scared as it will be my first time using clay. There really isn’t much to say about anything until an individual develops some real personal experience by actually electing to use clay. I cited the importance of taking therapeutic clay internally. Clay use seems to calm the immune system down, and make it less reactive to metal toxicity… in effect, increasing the body’s threshold to handle dangerous metals during the cleansing process. Too many people assign more importance to internal or external clay therapy. They both have their proper place, and they both provide a very powerful therapeutic modality. I noted that the only thing to watch out for is prolonged exhaustion after clay baths. Exhaustion shouldn’t last for more than 1.5 hours (unless an individual sleeps to recuperate). In the event of overwhelming exhaustion, clay baths can be paused to allow the body to recover. I stated in clear terms that she shouldn’t listen to most about using clay for acute toxicity; they may steer an individual poorly if they don’t have a lot of experience dealing with acute toxicity. Many companies sell a tiny amount of clay for use in bath; it’s better to buy in bulk and use at least six cups per bath. “I feel completely lost and scared now. I’ve read the inserts and the clay is not to be mixed with anything, should I use it alone? It just says [brand removed] and I don’t know clays so I don’t even know if it’s really the calcium bentonite that I asked for. I despise it when an individual doesn’t have the money to try to take care of health issues. I know the feeling very well. The advice given to the mother was poor advice for acute toxicity; a small sachet with a bit of clay and herbs in it. I explained that sea minerals are a great addition to clay baths, but they aren’t absolutely necessary to use, and that it would probably be better to use no salt at all than sodium chloride. I had also suggested that she use broken cell wall chlorella, which she ordered. There are only two ways to deal with fear. One is to rise above it (let it go). The other is to face it head on. Running never helps, it just reappears in a different form later, or catches one when one is no longer able to run. The only thing more patient than fear is love. However, I felt no need to actually comment. This is typical when poor advice is given: Too little clay used results in too much mobilization of metal with not enough detox support. This is the catch 22 of all chelation protocols, but one in which clay is more than capable of safely handling if used correctly. The second issue that I always run into: Trying to give someone enough correct information to be successful without overwhelming them or “breaking the bank.” This type of education of natural medicine has to be done in stages, and often times, the educational process lasts years if not decades. Working with someone directly is very different from working with strangers continents away; suggestions are usually quite different (more comprehensive in person). It also works better when an individual is under the care of an extremely knowledgeable health care professional. I strongly believe that individuals should be under the care of qualified health care professionals. That said, the word “qualified” is a tricky one! … and many people can’t afford even the poor quality healthcare that is often available to them. “Hi Jason. Thanks so much, my eldest is so much better. I added more clay like you suggested and she was more exhausted and fell asleep after half an hour after bath. She slept right through without any complaints and is back to her old self. “The nose is burning a little but only for few seconds. I am however very concerned about the small one. I’ve stopped the dmsa. Unlike the first time, she started with a shaking leg, slurred speech and yesterday she couldn’t walk. She seemed confused and pulled her limbs and body funny. I need your advise. Can I start her on the baths too? She had the dmsa on Saturday. She’s biting her tongue and her fontanelle was completely in last nite. I’ve seen what the clay can do and very gently and safely. I want her to get better too. Please tell me what you think. She’s taking phosfotadil choline, apolactoferrin and lypospheric vitimin c daily. Do I give them before or after baths if I do baths for her? Thanks so much for all your help and advise. You won’t know how much it means to me. I’ve seen this amazing phenomenon over and over again: Fear dissolve away into hope and budding confidence! 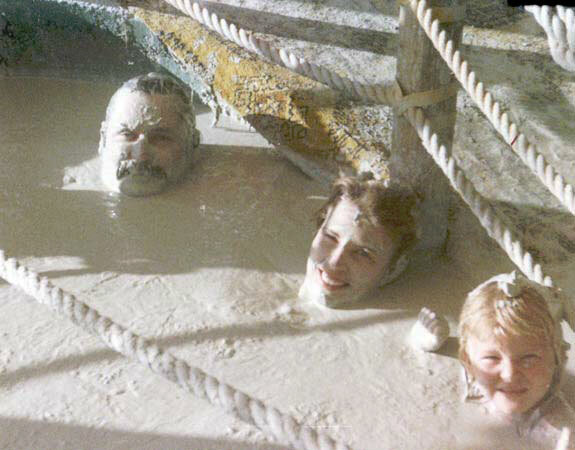 This is exactly what should happen with a good clay bath. Some people need more clay than others, but you don’t know until an individual actually starts using clay. More exhaustion followed by sleep, less symptoms of acute toxicity. I’ve known people who have needed three to four hours in-bath (very extreme situation) in order to get relief from chronic toxicity, but an individual should never do this without gauging personal tolerance and acclimating to clay use. My advice on using DMSA and other oral chelating agents is that if you can give the body enough cleansing support, they can be used safely. If not, then one should consider pausing use. It is entirely an individual choice, best made on a case by case basis. I mentioned that the supplements she is using can be used at any time desired as far as clay baths are concerned. I advised that her eldest daughter keep up with the clay baths, as she may be dealing with issues resulting from mercury exposure for quite some time. I of course suggested that the youngest begin clay baths; the result will be the same as was with the eldest. “Things are looking much better. My eldest is keeping up regular baths. She has 3 teaspoons of cilantro per day as well as freshly squeezed lemon water and drinking clay once daily. She complains less of pain and her skin looks brighter. Before her face had white spots and the cheeks nose and fingers were very pink. “She does however complain of her legs getting lame, and they do so very often. The cough is much better and I have her take out any phlegm she coughs up. Her eczema has cleared up completely, before I tried everything on the market to get rid of it. She does feel very windy and sometimes says there’s a wind stuck in her throat. The little one also has the drinking clay and I couldn’t believe it, the clay actually corrected the constipation in both of them. The dark circles around her eyes are gone now and she doesn’t cry about stomach cramps anymore. She doesn’t like lemon water,but does drink a lot of water. I try to get her to have lemon water in small quantities the whole day. She loves cilantro so I don’t have a problem getting her to eat it. I add into meals and salads or blend and give as a chutney or sauce. The throat infection seems to have cleared up and the redness and burning in the private region is also gone. She does jerk a lot in her sleep. Could that be because of the toxins being pulled out? I used the drinking clay for a few days and my peptic ulcer hasn’t troubled me ever since, but I stopped using it, because I am breastfeeding and I’m not sure if it can affect little ones health, as I also had some of the merc tox symptoms. I’m really feeling much better now that kids are getting better. Thanks so much for helping me get kids better. There was a time when things were so bad that I thought horrible thoughts, but thanks to you I know now there’s hope. Now that’s a mother with determination and courage! It never ceases to amaze me, even after all of these years, how powerful simple natural medicine can be in aiding the human body. While this family is not completely out the woods, they have a basis for true recovery. That there is a condition, a cause for the condition, and the result of the condition. All three of these issues need to be dealt with, sometimes separately. The condition was mercury toxicity, the cause was over-exposure to nascent mercury, and the result was a whole host of physical and mental complaints. Some may be longer lasting. The lame leg is either caused by mitochondrial failure or is neurological; either way, both are likely due to the mercury exposure. ONce the mercury is removed, and once the immune system stops freaking out (over-reacting), the body, given the proper nutrients, can slowly heal. Clay Detox Baths ~ Clay Disciple Style! An example of acute mercury toxicity and using natural medicine to help with symptoms. How wonderful! just found you and I can see you know stuff that many that have spent years studying health (both conventional and alternative ) don’t know! I will read all your posts – you are a good one to learn from. I also use clay internally, food grade sodium bentonite which is actually almost white in color, and is expensive. I have found you because I wanted to find out if pure bentonite must be food grade in order to use it internally. What is your opinion? I respect your opinion. It really depends upon the clay. Alot of people use the term ‘food grade’. Most pharmaceutical grade clays are over-processed (chemically processed), and I wouldn’t use them internally or externally. There are a few good USP grade clays out there (including our USP grade sodium bentonite). My personal favorite clays are raw; the best clay sources are so good they can be used directly from the ground, without any need for processing. Good that she took your advice! It’s sometimes difficult to get people to take clay internally for the first time. I remember when I equated the idea of eating hydrated clay to “weird things” like uropathy and enemas. Well, maybe uropathy’s still a tad bit weird. Thanks for the story and info! 🙂 Much appreciated example!